Heat oven to 350°F. Spray cookie sheet or 15 x 10 x 1-inch pan with cooking spray. Drain juice from pork roast into blender; set aside. Shred or chop pork into bite-size pieces; set aside. Unroll dough into 1 large (about 14x9-inch) rectangle. With kitchen scissors or sharp knife, cut dough crosswise making 2 (9x7-inch) rectangles. Sprinkle each dough rectangle with 1/2 teaspoon cumin and 1 teaspoon garlic. Place half of ham and half of cheese in 3-inch-wide strip lengthwise down center of each dough rectangle. Divide pork evenly over cheese. Bring long sides of dough up over filling to meet in center; pinch seam to seal. Pinch ends to seal. With pancake turner, place seam side down on cookie sheet or 15x10x1-inch pan. Cut 3 diagonal slashes in top of each sandwich. Bake 25 to 30 minutes or until golden brown. Remove from cookie sheet; place on wire rack. Cool 5 minutes. Meanwhile, pour broth and undrained green chiles into blender with juice from pork; blend on medium-high speed 15 to 30 seconds or until smooth. Pour juice mixture into 2-cup microwavable measuring cup. To serve, microwave juice mixture on High 2 to 3 minutes or until hot; divide mixture into 4 (6- or 8-oz) ramekins or cups. Cut each sandwich diagonally in half. 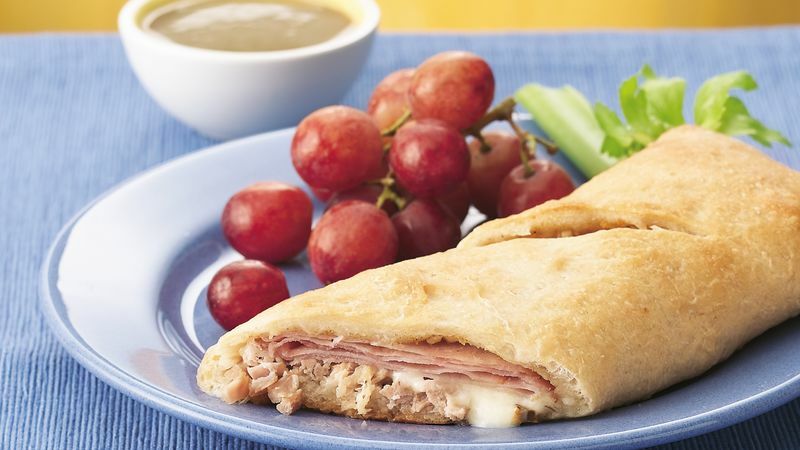 Serve sandwiches with juice mixture for dipping.